Jacinda Ardern attacked my report in last week's Sunday Star Times. Lobby group report ignores the realities. I wrote a response below but have been told that only a 150 word letter-to-the-editor will be accepted. She gets nearly 500 words to attack and I get 150 to defend. Here is my full rejected response. 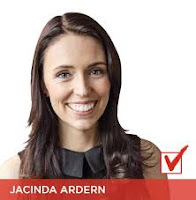 The Family First report Child Poverty and Family Structure: What is the evidence telling is?, attacked by Jacinda Ardern in last week's Sunday Star Times, traced the change in family structure from 1961 - the year more babies were born than ever before, or ever since. Families were much bigger, mother's educational qualifications far fewer and their work force participation much lower. Yet child poverty was also very low. Under 5% of families with children lived in the two lowest household income bands. Using the measure Labour/Greens favour (because it provides the highest estimate and greatest political impact) child poverty grew to around 16% by 1990 following 15 years of growing unemployment and numbers of sole parent families. Because so many children relied on welfare, it then shot up after the benefit cuts, peaked around 2001 and has fluctuated since. In 2014 it still sat at 29% despite unemployment falling to 5.7 percent. Ardern says Family First ignores realities. Here is the reality she and Labour ignore. The strongest correlate for child poverty is the sole parent rate. Ardern is correct to say that de facto relationships and single parenting didn't, "...all of a sudden become 'on trend'." The growth in the rate of each is tracked in the report. Increasingly single parent families became the product of births to single females and this is now a well-established pattern. In 2015, 5% of babies had no father details on their birth certificate; a further 15% had fathers with different residential addresses to the mothers. This is then reflected in the number of babies who will be benefit-dependent either immediately or shortly after their birth - 17.5 % of all babies born in 2015. It is somewhat fatalistic to bring a baby into the world with no means of supporting it and then start complaining about low wages, low benefits and high housing costs. That's after the fact. Yes, two parent families also experience poverty but it tends to be short-term because their incomes are generally derived from the market. Sole parent incomes are generally derived from benefits which create a trap for poorly educated and unskilled mothers and lead to long-term child poverty exposure. New Zealand's largest longitudinal study, SoFIE, showed that two parent families move out of poverty faster. Those most likely to stay poor over many years are Maori and sole parents. Marriage comes into the income equation because marriages are far more stable than de facto relationships. By the time a child turns five, his parents are 4-6 times more likely to have separated if they were cohabiting rather than married. This high dissolution rate also drives sole parenting, leading to more child poverty. But even stable cohabiting relationships are often poorer because they are second or third partnerships struggling to support children from previous unions. Ardern claims "low wages and staggering house costs" are the major reasons 305,000 children live in poverty. Housing costs are contributing latterly, especially in Auckland. But the report details evidence from the New Zealand Institute for Economic Research that finds, with regard to the long-term picture, "...the cost of renting has remained broadly stable relative to income over many decades." Child poverty pre-dates the housing affordability problem by a long margin. Perhaps relatively higher wages contributed to lower child poverty in the 1960s but does Ardern think voters want a return to state-mandated award rates? And while Working For Families - a Labour policy - goes some way to easing child poverty, it also subsidizes employers keeping wages artificially low. Similarly, rental subsidies go straight into landlord pockets. MSD recently published findings from a literature review that found, "... a proportion of demand-side housing subsidies is capitalised into higher rents in the private rental market." A government cannot subsidize its way out of child poverty problems. Take another example. Subsidizing sole parents saw their portion of families with children almost triple between the 1976 and 2013 censuses. The answer to solving the child poverty problem lies largely with individuals. Without a reverse in the trend away from stable, committed two-parent families, child poverty will remain high. "...abuse and neglect inflicted on young children is a product of staggering levels of poverty..."
"Thirteen children died in New Zealand during 2015 in similar circumstances. Their average age was three. Over half the victims were Maori, one of the most exploited layers of the New Zealand working class. In the final analysis, the abuse and neglect inflicted on young children is a product of staggering levels of poverty, social breakdown and family dislocation." So, there is no self-will available to this "most exploited class"; no access to feelings of humanity or compassion; no intellectual escape from the exploitative oppression. So how is it that within this "most exploited class" a massive majority do not beat and kill their children? What makes them different? The socialist explanation for the horrors that occur to some children is utterly deficient. The most common cause of death for a child was a head injury, followed by asphyxia, which includes suffocation, strangulation and carbon monoxide poisoning. The circumstances of Moko's death were extraordinary. Protracted and unspeakable. Where are the fathers? Where is accountability? Since Martin Van Beynan asked the question, Why doesn't anybody ask the questions? three more published writers have expressed very similar sentiments. Ewen McQueen, in the NZ Herald, "The court has reached its verdict. The marchers have gone home. The politicians and media have done their usual hypocritical hand-wringing. But the question remains - where was Moko's dad?" He then generalised it to, where are the fathers? David Seymour writing in the Sunday Star Times (opposite Jacinda Ardern who slated my child poverty and family structure report but more on that soon) asked, "Where the hell was his Dad?" referring also to Moko but broadening to a "fatherhood crisis". I am sorry for women left alone and homeless with dependent children, but increasingly annoyed that nobody tracks the fathers of the children down to see how they are living, and ask why everyone else should pay for their offspring. While suffering mothers and children pose for the cameras, how come nobody ever asks such obvious questions? It takes years, even decades for public opinion to reach tipping point but societal acceptance of fatherless families is on the wane. I'd vote to abolish the Office of Children's Commissioner because it's just more state bureaucracy and to date, the lead role has only been occupied by seeming leftists. But I've always had some time for Andrew Becroft because he was prepared to stand up and say the most common factor among the youth that came before him as Principal Youth Court judge was a lack of a father. And he said it during the last Labour innings. He says he's never written a young person off, though there is an air of "desperate inevitability" that comes with the family situations of some of them. "I've always felt that with the right intervention, and with the right people in a young person's life, there is always hope. "The reality is for some that is never going to be the case. But you never know, you see - you can't say for sure." There is something about the job that "gives while its takes". "There are enough stories of significant change to help you through the more distressing or despairing times when you wonder if change is possible." So I wish him luck.